Keep in mind that you need a fast Internet connection during installation since you’ll have to download a lot of data! If you feel the desire to try out both methods below (with Vagrant and without), make sure you use different training directories! The two installations do not coexist well. If you are not used to running Plone on your laptop skip this part and continue with Install VirtualBox. 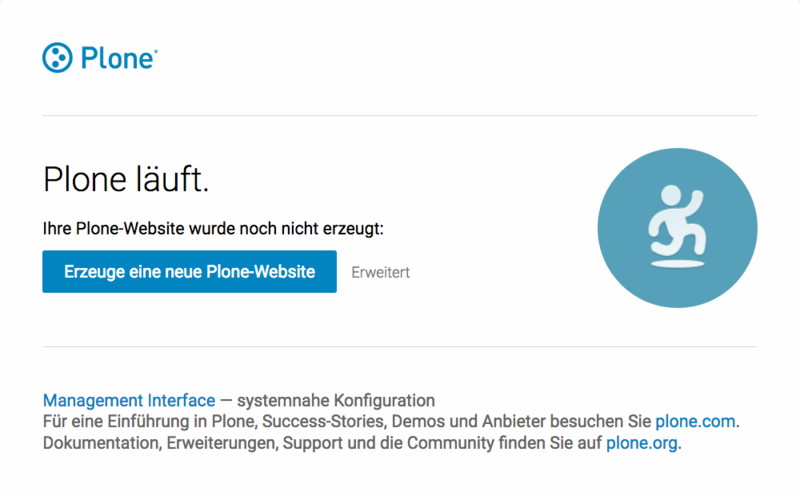 To run Plone 5.1 you at least need Python 2.7.9! You can use the editor you are used to. You can use omelette to have all the code of Plone at your fingertips. You do not have to switch between different operating systems during the training. If you feel comfortable, please work on your own machine with your own Python. Please make sure that you have a system that will work, since we don’t want you to lose valuable time! Please make sure you have your system properly prepared and installed all necessary prerequisites. The following instructions are based on Ubuntu and macOS, if you use a different operating system (OS), please adjust them to fit your OS. For more information or in case of problems see the official installation instructions. This creates a virtualenv with Python 2.7 in the folder buildout and installs some requirements in it. 2018-10-26 11:59:16 INFO ZODB.blob (57231) Blob directory `/Users/pbauer/workspace/training_buildout/var/blobstorage` is unused and has no layout marker set. Selected `bushy` layout. 2018-10-26 11:59:16 INFO ZODB.blob (57231) Blob temporary directory '/Users/pbauer/workspace/training_buildout/var/blobstorage/tmp' does not exist. Created new directory. /Users/pbauer/.cache/buildout/eggs/Products.CMFPlone-5.1.4-py2.7.egg/Products/CMFPlone/browser/syndication/views.py:17: DeprecationWarning: wrap_form is deprecated. Import from plone.z3cform.layout instead. Monkey patching MailHosts to print e-mails to the terminal. This is instead of sending them. NO MAIL WILL BE SENT FROM ZOPE AT ALL! return to normal e-mail sending. If the output says INFO Zope Ready to handle requests then you are in business. If you point your browser at http://localhost:8080 you see that Plone is running. There is no Plone site yet - we will create one in chapter 6. Now you have a working Plone site up and running and can continue with the next chapter. You can stop the running instance anytime using ctrl + c.
If there is an error message you should either try to fix it or use vagrant and continue in this chapter. We use a virtual machine (Ubuntu 18.04) to run Plone during the training. We rely on Vagrant and VirtualBox to give the same development environment to everyone. We use it together with Oracle’s VirtualBox to create and manage a virtual environment. Vagrant uses Oracle’s VirtualBox to create virtual environments. Here is a link directly to the download page: https://www.virtualbox.org/wiki/Downloads. Get the latest version from https://www.vagrantup.com/downloads.html for your operating system and install it. Now your system has a command vagrant that you can run in the terminal. First, create a directory in which you want to do the training. If you already have a training directory because you followed the Installing Plone without vagrant instructions above, you should either delete it, rename it, or use a different name below. Setup Vagrant to automatically install the current guest additions. You can choose to skip this step if you encounter any problems with it. Now download plone_training_config.zip and copy its contents into your training directory. The training directory should now hold the file Vagrantfile and the directory manifests which again contains several files. If this happens or you have the feeling that something has gone wrong and the installation has not finished correctly for some reason you need to run the following command to repeat the process. This will only repeat steps that have not finished correctly. You can do this multiple times to fix problems, e.g. if your network connection was down and steps could not finish because of this. The configuration may have stalled out because your computer’s BIOS requires virtualization to be enabled. Check with your computer’s manufacturer on how to properly enable virtualization. Once Vagrant finishes the provisioning process, you can login to the now running virtual machine. If you use Windows you’ll have to login with putty. Connect to vagrant@127.0.01 at port 2222. User and password are vagrant. You are now logged in as the user vagrant in /home/vagrant. We’ll do all steps of the training as this user. Instead we use our own Plone instance during the training. It is in /vagrant/buildout/. Start it in foreground with ./bin/instance fg. 2018-10-26 09:52:43 INFO ZODB.blob (27181) Blob directory `/home/vagrant/var/blobstorage` is unused and has no layout marker set. Selected `bushy` layout. 2018-10-26 09:52:43 INFO ZODB.blob (27181) Blob temporary directory '/home/vagrant/var/blobstorage/tmp' does not exist. Created new directory. /home/vagrant/buildout-cache/eggs/Products.CMFPlone-5.1.4-py2.7.egg/Products/CMFPlone/browser/syndication/views.py:17: DeprecationWarning: wrap_form is deprecated. Import from plone.z3cform.layout instead. Now the Zope instance we’re using is running. You can stop the running instance anytime using ctrl + c.
If it doesn’t, don’t worry, your shell isn’t blocked. Type reset (even if you can’t see the prompt) and press RETURN, and it should become visible again. If you point your local browser at http://localhost:8080 you see that Plone is running in Vagrant. This works because VirtualBox forwards the port 8080 from the guest system (the vagrant Ubuntu) to the host system (your normal operating system). The Buildout for this Plone is in a shared folder. This means we run it in the vagrant box from /vagrant/buildout but we can also access it in our own operating system and use our favorite editor. You will find the directory buildout in the directory training that you created in the beginning next to Vagrantfile and manifests. The database and the python packages are not accessible in your own system since large files cannot make use of symlinks in shared folders. The database lies in /home/vagrant/var, the python packages are in /home/vagrant/packages. If you have any problems or questions please mail us at team@starzel.de or create a ticket at https://github.com/plone/training/issues. Installation is done automatically by vagrant and puppet. If you want to know which steps are actually done please see the chapter What Vagrant is and does. Use the vagrant suspend or vagrant halt commands to put the VirtualBox to “sleep” or to “power it off” before attempting to start another Plone instance anywhere else on your machine, if it uses the same port. That’s because vagrant “reserves” port 8080, and even if you stopped Plone in vagrant, that port is still in use by the guest OS. If you are done with a vagrant box, and want to delete it, always remember to run vagrant destroy on it before actually deleting the directory containing it. Otherwise you’ll leave its “ghost” in the list of boxes managed by vagrant and possibly taking up disk space on your machine. See vagrant help for all available commands, including suspend, halt, destroy, up, ssh and resume.